This photo was shot in a studio when I was shooting a bike frame advertisement. The illusion of the rider flying over the top of you was always cool. 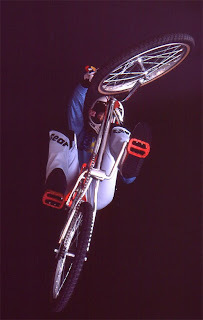 I began racing BMX in San Diego, California about 1973. My home tracks were Rancho San Diego and The Bike Shop of El Cajon track. I also raced a number of the other tracks around San Diego in the 70's. I was lucky that I lived just a couple of miles from Wheels 'N Things a bike shop that had all the best parts and a great team. Guys like Eddie King, Coy Hudson, Boo Boo Moreno and others rode for the shop. Racing Rancho was awesome because this super fast downhill track was one of the best! I even raced sidehacks with Scot Breithaupt back then and I have the photos that I will post. After years of collecting I have finally begun to scan, sort and tell the story of BMX through my collection. Please feel free to comment and also check out my others blogs like Vintage BMX Stickers Blog. VISIT THE BMX RETRO Ebay STORE!